Create community of learners, using the Community of Inquiry (COI) Framework. Bloom’s Digital Taxonomy categorises six stages of thinking skills: Remembering, Understanding, Applying, Analyzing, Evaluating, and Creating. See this figure for the verbs which refer to digital tools and technology that are associated to different levels of thinking skills. It starts from low order thinking skills (LOTS) to high order thinking skills (HOTS). For example, googling and recording are associated to the low order thinking skill of Remembering. Filming and podcasting are associated to high order thinking skill of Creating. For a more comprehensive listing of the verbs, click here. 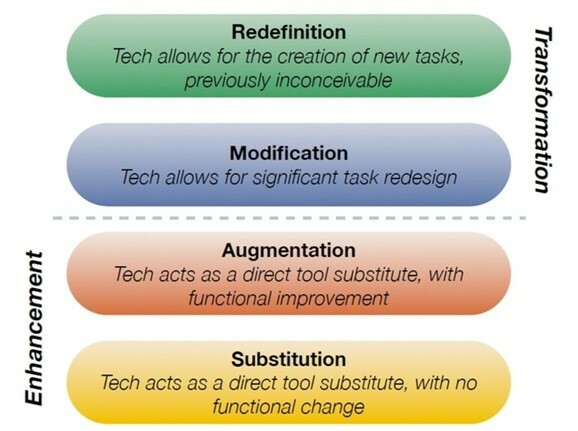 Substitution Augmentation Modification Redefinition (SAMR) model describes the impact of technology on learning, from low impact (learning is enhanced) to high impact (learning is transformed). The model lists the lower impact on learning, first as directly substituting the current task with no functional change; and second as augmenting the current task with functional improvements. Higher impact on learning is seen at the third stage as modifying the current task to bring about significant task redesign; and the fourth stage as redefining the pedagogy to create new, previously inconceivable tasks. See this figure for illustration of the SAMR model. Source: Puentedura, R. R. (2013). SAMR: Moving from enhancement to transformation. For a list of educational technology tools that facilitate different types of learning activities (e.g. animation, collaboration, discussion, mindmapping), click here. Advances in adaptive learning technologies have now made it possible to redefine pedagogy through personalising the learning experience for each individual student – targeting improvements in weaker areas, helping with knowledge retention and providing feedback that is “just in time, just enough, and just for me.” Adaptive digital learning takes into account current student performance, and adapts accordingly to support, and maximise learning. Find out more about adaptive learning and if your course has a textbook with adaptive features at this link. Please contact CTE at cte@smu.edu.sg for more information. Community of Inquiry (COI) informs the methodology to deliver successful online learning, by building a community of learners. 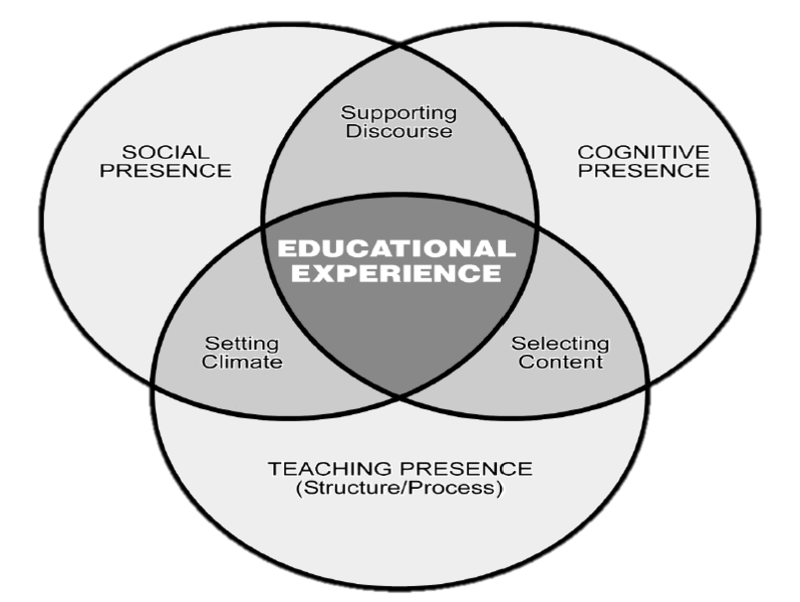 Teaching presence: It is about the presence of the instructor when designing the course, facilitating and assessing learning. The instructor guides students through course materials, reinforce key concepts and foster student engagement. The instructor encourages or acknowledges students’ contributions, injects knowledge, or diagnoses misperceptions. Social presence: It is about participants establishing social connections within the class by projecting their individual personalities to communicate purposefully in a safe environment. Be mindful that students can find online classes impersonal, lacking support for learning and affirmation of contributions, as compared with inclass interactions. Strong social presence supports the discourse necessary for the cognitive presence. Cognitive presence: It is about students constructing meaning through reflection and discourse. The instructor sets appropriately challenging tasks and guides students through the learning process as they individually explore issues and formulate solutions through divergent ideas. Students work in groups to reach some convergence by connecting ideas, identifying relationships and proposing solutions. The entire group comes together to apply and test solutions in real-world scenarios. Students are expected to defend their solutions with reasoning. The relationship and function of these three components are explained in this figure. ^ Source: Garrison, D. R., & Vaughan, N. (2008). Blended learning in higher education: framework, principles, and guidelines. San Francisco: Jossey-Bass. The e-book can be accessed from the SMU Library database. The hardcopy is also available in the Li Ka Shing Library. Churches, A. (2008). Bloom's Digital Taxonomy. Garrison, D. R., & Vaughan, N. (2008). Blended learning in higher education: Framework, Principles, and Guidelines. San Francisco: Jossey-Bass. Last updated on 04 Mar 2019 .